After our weekend trip to SFO, we set out to explore the Swami Narayan Temple in Chino Hills, California the next Saturday. Chino Hills is about half an hour's drive from LA, and we experienced the most pleasant climate on our way to the temple. 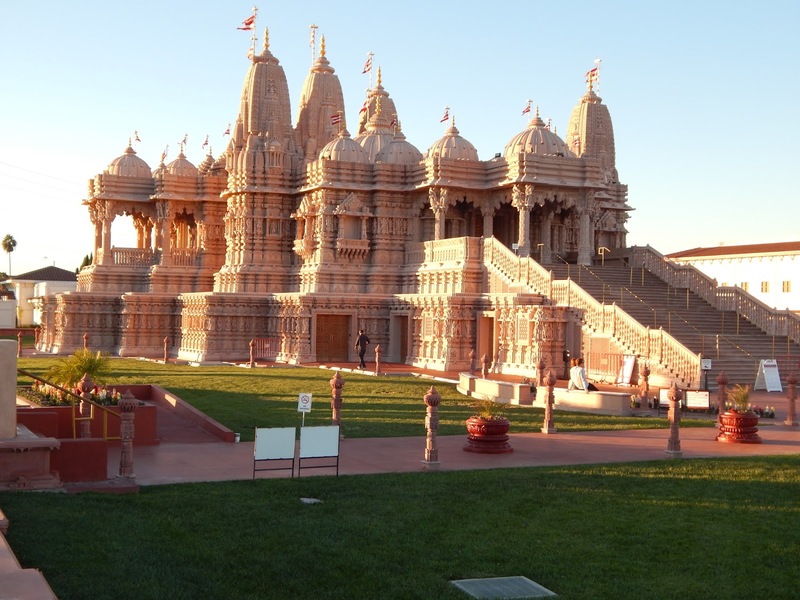 I admit I haven't seen every single Swami Narayan Temple in India, but this one in Chino Hills has to be the best one I have seen till date. This is also where I shot an outfit post wearing my Bandhani Saree. A few of our American friends had joined us and they were so awestruck and mesmerized by its beauty, that they were already making plans to visit India. So if you are visiting Southern California or are near LA, make sure you add this place in your must visit places. The property was huge, the temple had intricate carvings and we took an elevator to enter the temple. It was a very beautiful experience. If you thought the exterior was beautiful, wait until you enter inside the temple. No cameras are allowed beyond the elevator. We had visited this temple the weekend after Diwali and the temple still had the Diwali decorations. 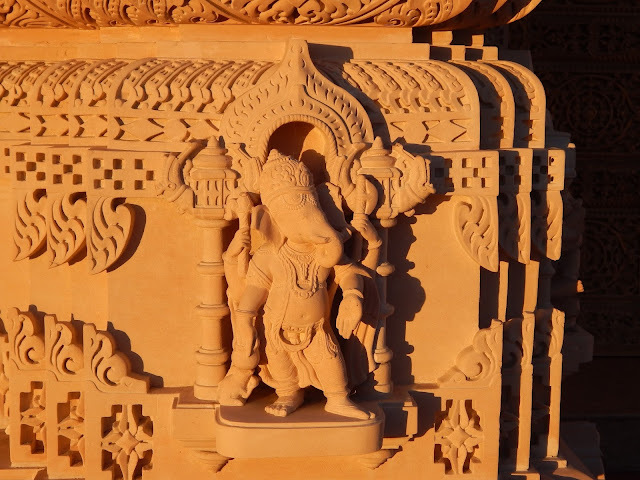 The interiors have intricate carving on white marble and the statues of Swamis and Gods are breathtaking beautiful and in gold. I spent majority of my time, explaining the relation between Radha and Krishna, the elephant head God and the Jain concept of not eating garlic and onions to my American friends. After the Darshan, we moved on to check out the cafeteria. We sampled some lip smacking Khasta Kachori, Sev puri and Chai there and our friends were delighted as they hadn't tasted Indian Chaat ever. All in all, it was a lovely evening spent, and I wouldn't mind visiting this place again and again. This temple is very similar to the Swaminarayan Akshardham in Delhi! Beautiful pictures! Gosh, it's so beautiful! I can't take my eyes from those photos. 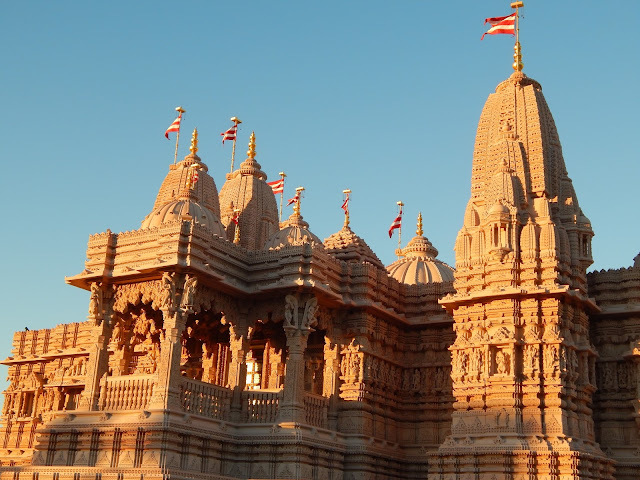 Never thought such wonderful temples exist outside of India. Really. I think you should tell more people about it. And also about the relation between Radha and Krishna. Maybe even in different languages! If you ever need a translation, please, visit PickWriters first. It's a great site where you can find not only a translation service, but also compare prices between different firms, read review and a lot more!